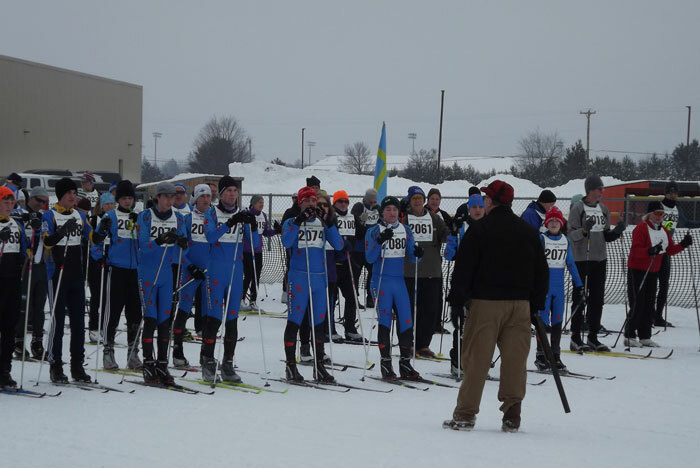 The 2019 White Pine Stampede had the best snow in years! The 49km race had over 2,400 feet of climbing; the 20k race climbed over 1,000 feet. The 10k race had a a little climbing but was mostly downhill. 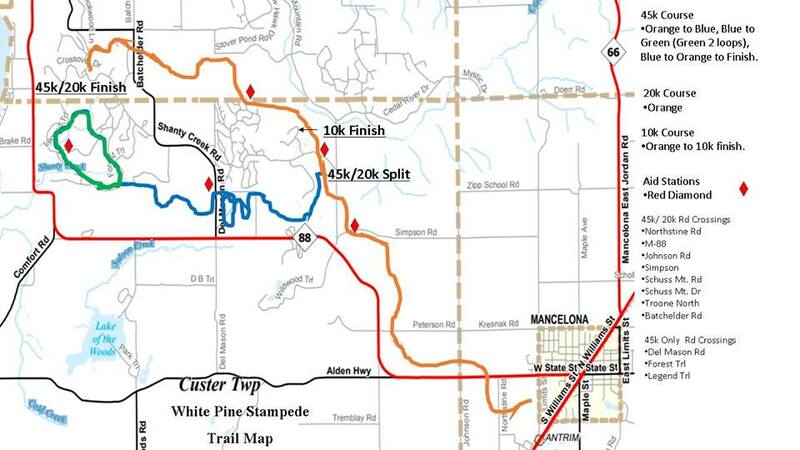 The course was divided into two main parts: the main 20km trail led from the school in Mancelona, Michigan to Schuss Mountain (10km finish) then on to The Summit at Shanty Creek (20km finish). Just before the 10km finish, a separate 25km loop was used by the 50km racers. 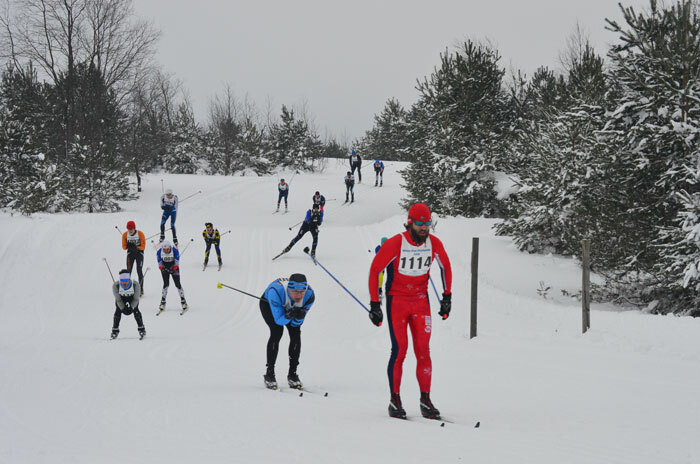 Racers skied an out-and-back trail, with two laps around a loop at the far end. The main 20km trail had been upgraded, with a number of trees cut so the big Shanty Creek groomer could pass through. Tracks were set on both sides of a wide skating lane. The 25km spur was partially groomed by the big groomer, and at a certain point the trail narrowed so only a small groomer could be used. With two feet of snow falling in the days leading up to the race, and record cold temperatures, the groomers made extra passes on the course to pack the snow. Tracks were firm and the skate lane were fairly firm with just a little softness. Skiers who used tiny baskets on their poles had issues, as the snow in places would not support those baskets, and the poles could bury themselves a foot into the trail! Tracks were generally faster than the skate lane, at least on the main trail. Some skaters used the tracks to doublepole or marathon skate. 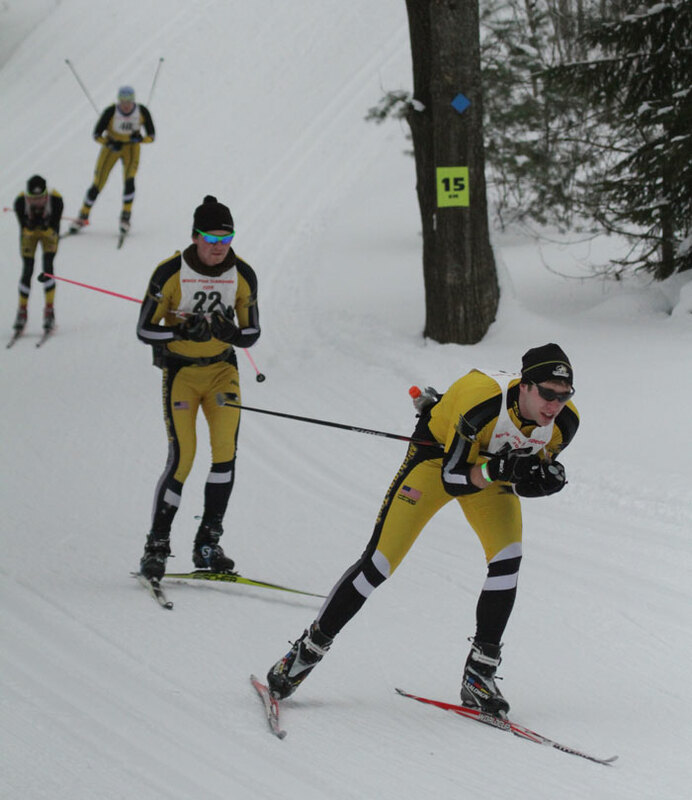 The men's 50km skate race (actually 49kms) was dominated by alumni from Michigan Tech's Nordic Ski Team - the Tech skiers took the top five spots! Vasa Ski Club's Sam Holmes won the race in 2:42:36, followed by Team NordicSkiRacer teammates Kyle Hanson and Jay Woodbeck (2:43:42 and 2:45:14). 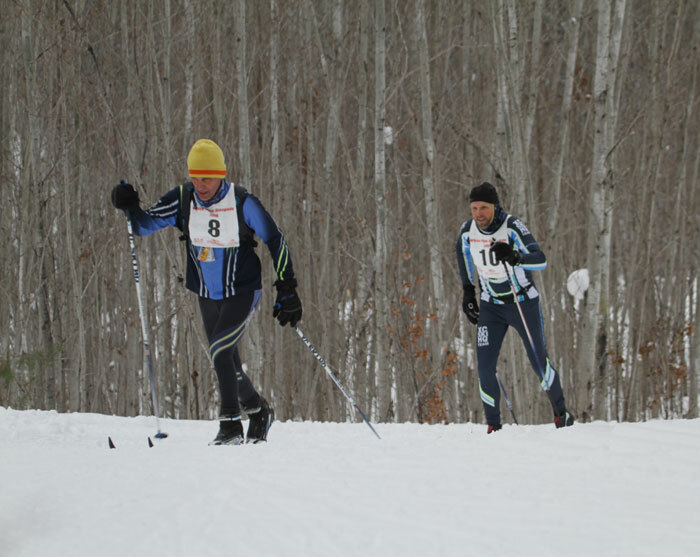 In fourth and fifth place were Thomas Kendrick and Team NordicSkiRacer's Matthew Wong (2:45:22 and 2:57:52). The classic race was won by Randy Smith (3:39:01) and Jennifer Brown (4:45:27. The second and third place men were Mike Everts (3;50:43 and Tom Wernette (4:32:04). Second and third place women was Lynne Brach in 5:16:36 and Tami Stagman in 5:57:36. Caroline Urbain (1:51:40) bested Marnie Sutter (1:55:40) and Gwenn Stevenson (2:04:42) to win the 20km women's classic. Jorn Zimmerling, Daniel Novak, and Dave Borton where the top three men (1:15:49, 1:19:52, and 1:21:48). Lars Hallstrom stayed ahead of John O'Hearn to win the 20km freestyle (1:03:03 and 1:03:21). Kevin Tarras was third in 1:06:52. Rebecca Davis added to her wins this year with a first place in the freestyle, winning in 1:13:35. Ellie Callison and Tracy Gravlin were second and third in 1:20:28 and 1:20:53. The fastest 10km women classic skier was Kayla Decker in the 13-17 age group. She won in 41:09, over 20 minutes faster than the next women. Fastest classic man was Robert Greene, who just beat out Rich Axtell, 53:54 to 53:57. The winning skaters were Ashley Chmielewski (36:56) and Josh Fairbanks, both in the 13-17 age group.